The description is given for the speckle interferometer of the BTA 6-m telescope of the SAO RAS based on a new detector with an electron multiplication CCD. The main components of the instrument are microscope objectives, interference filters and atmospheric dispersion correction prisms. The PhotonMAX-512B CCD camera using a back-illuminated CCD97 allows up to 20 speckle images (with 512×512 pix resolution) per second storage on the hard drive. Due to high quantum efficiency (93% in the maximum at 550 nm), and high transmission of its optical elements, the new camera can be used for diffraction-limited (0.02″) image reconstruction of 15 m stars under good seeing conditions. The main advantages of the new system over the previous generation BTA speckle interferometer are examined. Original Russian Text © A.F. Maksimov, Yu.Yu. Balega, V.V. Dyachenko, E.A. Malogolovets, D.A. Rastegaev, E.A. 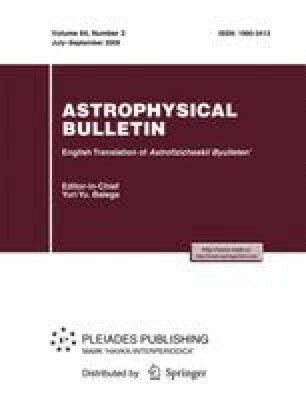 Semernikov, 2009, published in Astrofizicheskij Byulleten, 2009, Vol. 64, No. 3, pp. 308–321.